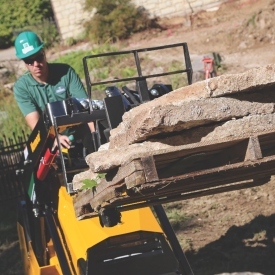 Whether it is site preparation or hauling heavy material, the CTX100 compact utility loader is up to the challenge. With versatile features such as dual hydraulic auxiliary controls and a universal mounting plate, this machine is ready to work for you. To help increase productivity and efficiency on the jobsite, the CTX100 is equipped with a 40-hp (29.8 kW) turbocharged engine and features a compact footprint. The robust design and outstanding power on the CTX100 will help you tackle those tough jobs – and it’s backed by a 3-year/3,000-hour limited warranty on the loader arms.